You gotta wonder: How much promo does a movie like Jurassic World: Fallen Kingdom really need? It’s a sequel in an established franchise, after all, opening up in peak popcorn season (opening June 22). Still, its promos seem to be all over the pace. We’ve already tasted the Jurassic Chomp Blizzard. And then the Onion, Inc. offices received a strange box in the mail. Unsurprisingly, it was addressed to A.V. Club film editor A.A. Dowd, who gamely and expertly opened the box for the AVC’s Instagram feed. He revealed a giant dinosaur egg, which contained a giant Dorito. Naturally, we passed it around the office like a humungous pop-culture communion wafer. When it got to me, I thought it tasted like Dorito-flavored cardboard. 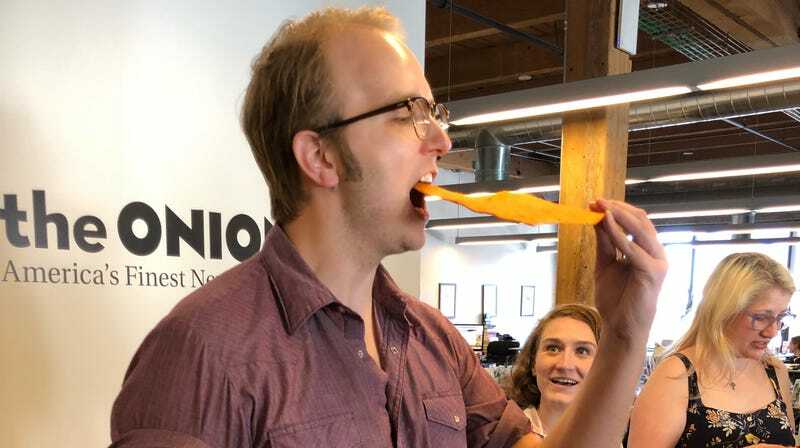 Obviously it had to be thicker to remain intact given its larger surface area, but at a detriment to a palatable taco chip crunch. The thickness made it a too-chewy mouthful which might have worked well as dry-wall material, if you wouldn’t mind your house smelling like nacho cheese powder. If you want your own such egg, Dorito’s is running a contest (surprise) in which a select number of winners will receive their box containing the giant chip. If you win, please let us know if you find a valuable use for that Jurassic Dorito. Pizza crust? Frisbee golf?